Board decks don’t actually have to be decks. Qualtrics, Domino, and Thumbtack employ Amazon-style ‘memos’ that communicate the same information through text. It really comes down to the most efficient and effective mode of communication for the management team. The goal of a board meeting should be to maximize the value you get as a founder, while minimizing the amount of time you spend preparing. Of course, if you don't prepare at all, you'll have a hard time keeping your board focused. That's why a good board deck is so important. It may sound odd that the presentation can contribute so much to the success of a board meeting. But consider this: A board's job is to give advice, help solve problems, reinforce best practices, and so on. When all of this is on topic, it can help guide you through the company-building process. When board members are left to explore whichever topics they choose...look out. The primary difference between company meetings and board meetings is that your employees spend every day at your company, which even the most committed board members can’t do. That means you’ll need to effectively and efficiently calibrate your board every time you meet. Hopefully, you invited these people to your board because they have relevant experience in areas where you need help. The calibration will be worth the effort if it enables you to leverage the skills and experience in the room to help you think through problems in a different way. Preparing a board deck is also an opportunity for you, the founders, to take a big step back. This is incredibly important to do. And if you don’t, no one else will. Treat board meeting prep as an opportunity to pull yourself out of the day to day and take a look at your company as if you were sitting on the moon viewing the earth: Are you executing? Are you innovating? Are you hiring? Are you building a management team? Are you growing the customer base? Are you doing so according to the last plan you laid out? And is that plan still good enough to win or do you need a new plan and new targets? This may sound like a significant undertaking for a three hour meeting that happens four to six times per year—and it definitely is if you build a presentation from scratch every time. It’s important, instead, to report to the board leveraging the materials you use to run the company. The Holy Grail is a board pack that is assembled by your assistant who simply prints the cover sheet(s) from weekly management-team reports and staples them together. Then you have no overhead and, even better, perfect alignment between the board and the management team. Distribute the board materials one to two days in advance and ask your board members to study the material ahead of time so you can spend the meeting discussing rather than presenting. Following is a general structure for an early board meeting/deck. We've seen our founders riff on this, and you can see some feedback from those CEOs below. In fact, Dropbox—where we partnered from the seed stage—has used this basic format from those early days onward, even as a public company today. Where the company needs help (e.g. hiring, customers, partnerships, product, and marketing). Note: All of this should be hard to create the first time but then simple to update moving forward. Forward-looking org chart: show current team and positions to be filled over the next six months. Product roadmap: include major launches and achievements since last meeting; provide a view on where the company is heading. Engineering and technical update: include major launches and achievements since last meeting; surface challenges and where help is needed. Growth team update: performance against Growth Team KPIs. Corporate marketing update: execution on positioning, brand, messaging, and PR. Business development: list of top 10 needle-moving partners the company wants (vs. inbound partner interest) and progress on each. Operations (if appropriate): performance against KPIs; surface challenges and where help is needed. Monthly Waterfalls for each of: revenue, burn, cash balance, headcount. Topic 1: deep dive in a particular functional area, deep dive on a large partnership opportunity, deep dive on a business challenge, etc. 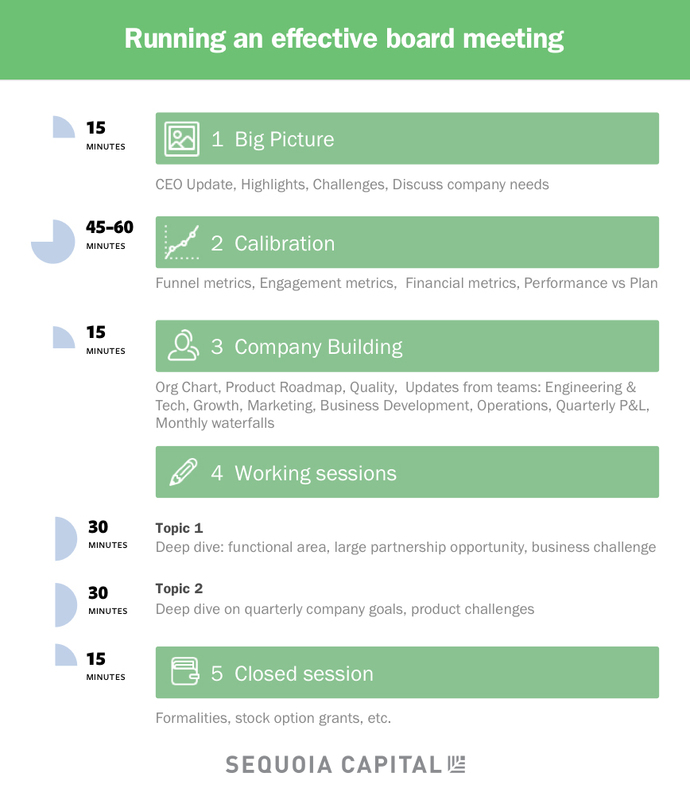 Topic 2: deep dive on quarterly company goals, product challenges, etc. Feedback to Founders, formalities, stock option grant etc.